Research confirms that it is six times more costly to attract anew customer than it is to retain an existing one. Creating a culture of service excellence requires planning,preparation, and persistence. Customer Service in HealthCare is designed to provide readers with the fundamentalinformation and skills to start or strengthen a customer serviceinitiative within a health care organization. This bookconcentrates on action as opposed to theory. It offers a practical,step-by-step process for creating a culture shift toward customerservice excellence at all levels of an organization, and presentsthe essentials to improving performance that will bring theindividuals closer to the mission, values, and standards. KRISTIN BAIRD's 20 years experience as a health care marketing and communications consultant, administrator, and registered nurse have shaped a keen understanding of customer service from a variety of perspectives. A facilitator, speaker, and writer, Ms. Baird conducts focus groups and management training sessions on a variety of health care issues. Senior Leadership that Takes theWheel. Creating Meaningful Standards to Live By. Customer Service Pointers for Physicians. 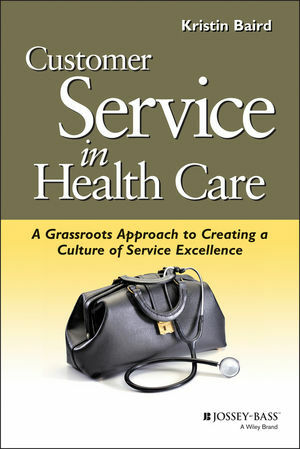 "Read this book for an action-oriented approach..." (TheHealthcare Collaborator, August 2001)"A wonderful guide that every manager can use. Kristin Baird'sadvice helps health care leaders understand the need for greatcustomer satisfaction." "Combines the inspiration of 'why to focus' on customer serviceswith the real-life 'how-tos'. An excellent road map for health careleaders that provides direction and milestones in the journeytoward a great customer service!" "The challenge of creating a thoroughly customer-orientatedculture in a health care organization is so more fundamental thansAnding a few people off to the 'Disneyfied'.... The challenge,however, can be met--as this book demonstrates--ifleadership appreciates the key role of middle managers and, as theauthor so wonderfully says, builds the culture 'from the groundup.' Filled with examples, techniques, and tips, the author comesfrom and speaks to the real world."